Every cloud has a silver lining. Clouds, there were just too many of them about this morning. Patches of blue sky teased racers and organisers alike, but the designated helicopter shuttle landing zone remained socked in all morning not allowing for the flying window needed to uplift 160 riders. The original plan of riding the legendary Wakamarina had to be put on ice for another year. Perhaps it was never meant to be, as our back up bad weather venue turned out to be a huge success and a barrel of laughs. When you have just had two full days of riding incredibly wet slippery, rooty, muddy and technical trails it turns out skipping a day of the same (helicopter or not) goes down pretty well. The racing and festivities were held at Jentree MTB which has an interesting story. It is now the home and property Kiwi legend Justin Leov. It’s where he learnt to ride, where he won his first national junior title and his first pro elite DH title. Now he’s developing the land and hills with a gnarly DH track and a super fun trail network. He delivered a fun mix of short flowwy challenging trails that were visible from the arena like race village finish area. Perfect for spectating between runs. The crowd favourite was the end of stage three. I say crowd favourite because the racers weren’t so sure about it. The organisers cruelly placed the finish line of the final stage of the three days racing on the “other” side of a freshly flooded stream now about 15 feet wide and about two feet deep. Being a blind race no one knew how best to cross this obstacle. Many techniques were tried but few worked at speed. The huck to flat to scorpion, the manual to bar fold over wobble and the finish line thrust approach to break the water surface tension then glide over were all tried with different levels of success or failure. In the end it took Steve Peat with a monster hop n pop to prove the creek could be cleared in one single leap which inspired a few others to give it a go but none looked as fast and stylish as Peaty. As is tradition at the NZ enduro final day there are lots of beers to drink, prizes and raffles to be won and yarns to be told. Mexican tacos went down a treat and the party continued until the last keg was run dry and final Moa sunk. Oh wait results, yes. It is a bike race after all even though for the most part it feels nothing like one which is the beauty and appeal of this race. The were no major change ups in the results from yesterday. Ines Thoma and Dimitri Tordo taking home the hand carved NZ Greenstone and Silky Saw Trophies in pro men and womens. But it was really the Ams and Masters who were the real winners taking bags and bags of swag and prizes home with them thanks to super supportive sponsors. 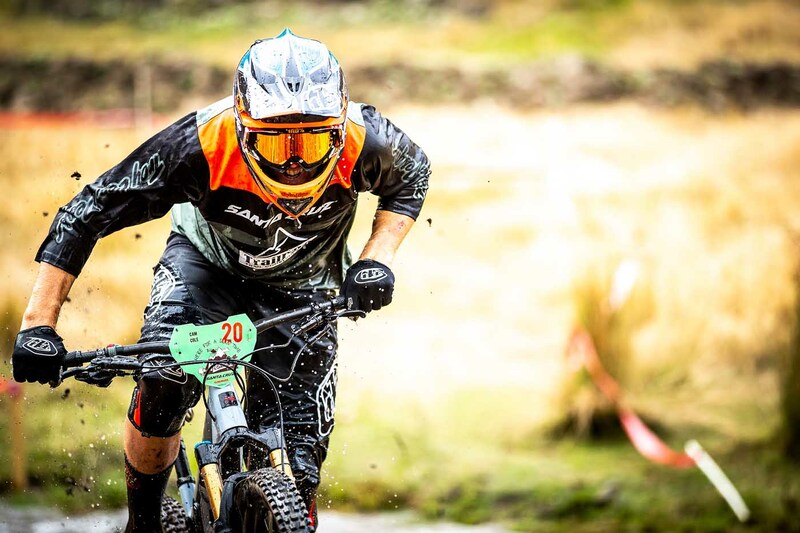 Cam Bisset, Cindy Chantreux and Max hides won their respective categories after three days and nine stages of racing. A big congratulations to all the racers who battled and survived a brutal three days racing. It was high fives and big smiles as Anka handed out the well earned Santa Cruz NZ Enduro finishers patches.